The unbelievable monster mule deer buck footage contained on this DVD is a "must see" for any hunter who loves big bucks! Journey with Jim Shockey and his team to what is arguably the very best monster mule deer buck country in North America, Canada, home of the world record non-typical mule deer. Join in the hunt for five Boone and Crockett class bucks, including one of the largest mule deer ever taken on camera by a muzzle loader hunter! Slip in on monster mulies to within yards in the wide open prairie. Be amazed at the number of giant mule deer bucks on this DVD. This production is the result of five years of filming by Jim Schockey's cameraman, world renowned videographer and mule deer hunting expert, Cody Robbins. 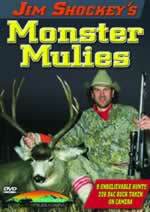 You don't want to miss this spectacular "Monster Mulies" hunting video presentation!